Defending ISAF Match Racing World Champion Ian Williams has led his team through a faultless round at Stena Match Cup Sweden winning all 13 of his Qualifying races as the event rolls into the start of the Quarter Finals tomorrow. 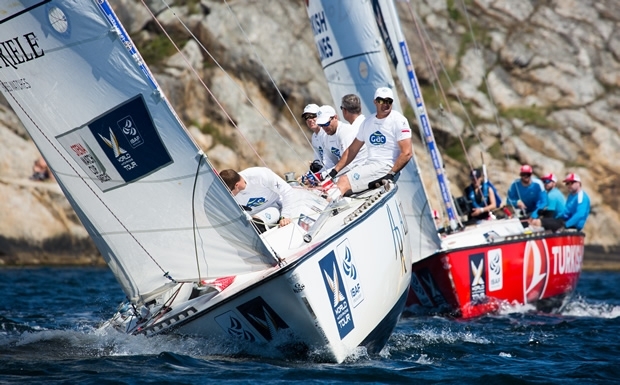 Stena Match Cup Sweden is the 3rd World Championship Event of the 2015 World Match Racing Tour. Joining Williams in the Quarter Finals are defending Stena Match Cup Sweden Champion Bjorn Hansen, Keith Swinton, Rueben Corbett, Taylor Canfield, Phil Robertson, Johnie Berntsson and Simone Ferrarese. Winning Qualifying gave Williams the first choice of his Quarter Final opponent. He chose fellow Tour Card skipper Reuben Corbett, leaving second-placed Bjorn Hansen to pick Wild Card skipper Simone Ferrarese. Australia’s Keith Swinton similarly didn’t race today but was safe for the Quarter Finals with 8pts and finished 3rd in Qualifying. Swinton selected Johnie Berntsson for his Quarter Final who has certainly found his stride this week in Marstrand and is confident his team have more to give in the final few days of the event. The fourth Quarter Final pairing matches Taylor Canfield and Phil Robertson, this week sailing for Trefor Match Racing in place of Nicolai Sehested. Robertson chose the hard route to his Quarter Final place by accidentally sailing an extra lap against Dane Rasmus Viltoft handing victory to Viltoft, and forcing Robertson into a must win his race against Switzerland’s Eric Monnin. It was the last of three losses today for Monnin unfortunately forcing him out of the competition. Quarter Final racing begins at 1030 CET tomorrow and with a forecast for sunshine and 15 knots of wind from the south, the racing will provide the thousands of spectators who flock to Marstrand every year plenty to enjoy and talk about, from the rocks surrounding the natural amphitheatre that is Marstrand Fjord or from the VIP hospitality pavilions right on the waters edge.